When you’ve lost the support of the whole Reagan family, you’re pretty much done for. While Republicans all across the country compete to see who can be the most like Ronald Reagan (hint – none of them can), the former president’s family (including his neoconservative son) have been vehemently distancing themselves from the GOP and its presidential nominee Donald J. Trump. It appears that that the only remaining Republican in the Reagan family may be on the verge of leaving the party for good. And it’s all thanks to Donald Trump. Reagan told another twitter follower that Nancy was personally appalled whenever Trump (or anyone like him) dared to compare themselves to Ronald. Considering how much influence Nancy had over her husband, is it a stretch to say she very well could have convinced him to vote for Hillary Clinton (if he and she were still alive)? Most likely, yes. Imagine that: all the remaining Reagan family members becoming Democrat because their party traded its values in order to support a racist, xenophobic, sexist, corrupt billionaire that no one likes. When you’ve completely lost the Reagan family, you may want to rethink your priorities. 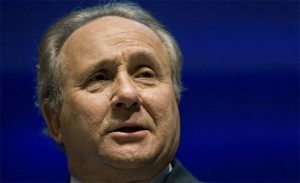 Thank you, Michael Reagan, for finally seeing the light and standing against a party that has decided to embrace the most deplorable elements if society instead of building on what you dad envisioned (even though that wasn’t really good either).